This one would make a great statue or little resin figure. Can never get tired of Mikey. Hey on another note, aside from the NY comic con, does mirage do any other shows in the new york area? What happened to those? I would so buy those action figures. 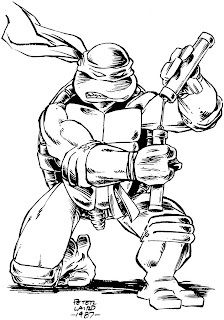 I especially love the Superhero TMNT designs. I love it. Mikey is my favorite. -->> Bet all these classic pin-ups look really nice taken all together taken as a group !! Tokka has a good point. Have you ever thought of compiling all these pages you put up on your "blast" blogs together into a trade? I'd buy it. Always a fan of Mike stuff.